If the Spartan Mosquito Eradicators are placed after the mosquito population has become established, it may take a little more time to bring the population under control. Use two kits per acre for the first deployment if the mosquito population is established. 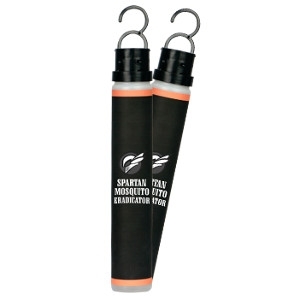 Fill levels are marked on the Spartan Mosquito Eradicators. Eradicators placed in dry climates may need to be monitored more often due to excess evaporation. Water evaporating will not harm the effectiveness of the Eradicators so long as water levels are returned to the fill levels marked on the label. Placing Eradicators in shade will reduce water evaporation.